It was an OK wax week. I didn't have anything that really blew me out of the water. I had two scents I felt were below average and two scents I thought were pretty good. My Thoughts: This one is strange. I keep really wanting to like it, but there is some weird note in there that just ruins the rest of it for me. This smells like a blend of maybe honeydew and honeysuckle. These are two scents I'm on board with, but when I melted it this weird caramel-like scent came out. It took a fresh melon and floral scent into this weird sugary artificial territory I do not like. I had to turn this one off it was just too strange and too sweet for me. My Thoughts: This smells nice. My complaint with this one is this is about as generic clean scent as you can get. It's a balance of clean laundry, water, and fresh air scent that you can pretty much find something similar in any candle/wax brand. There isn't anything that stands out about it or makes it special. There isn't anything wrong with the scent either. In fact, I think this would be one of those universally flattering scents. I just think there are more interesting clean scents out there. Plus, the throw isn't great. My Thoughts: This is heavy on the salty ocean water note paired with a green note. This is a more unique clean scent for sure. I like the blend of water notes with greenery and it's not something I see or smell often in retail scents. This scent is very refreshing and crisp. 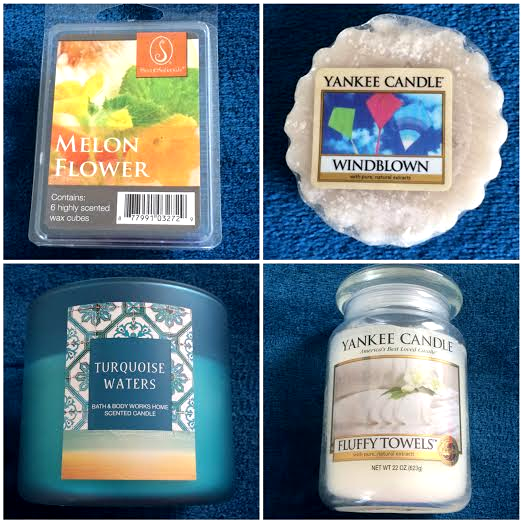 It's a strong scent too which I do get from a lot of B&BW candles, but not in an unpleasant way. This is also one of those year round scents. It's not tropical or beachy, so it fits any season. Scent Description: The fresh scent of clean towels warm from the dryer with notes of lemon, apple, lavender and lily. My Thoughts: This is actually one of my favorite YC scents. I've had this candle for awhile. I just haven't burned it. Fluffy Towels is an upscale clean laundry scent. I definitely get the clean laundry notes with lemon and a touch of floral. It reminds me of clean linens at a hotel. I really wish I had no complaints about this scent because I love it so much, but I have one. I can burn this scent for 4-5 hours no problem, but after that this one gives me a headache. I won't stop burning this one, but I have a time limit on it. I just think it's such a clean scent it can be a bit overpowering after awhile. If you like to chat about retail wax with other wax addicts check out the retail wax FB group!